Head Start QuickSource® reminds us that "When math is presented in a fun and creative way, teachers provide children with the opportunity to develop abstract reasoning skills, learn complex math concepts, and create solutions to real-life problems." One way to present math in a fun way is through song. Onomatopoeia occurs when a word imitates, or sounds like, the actual word name. Examples include: Quack, oink, swoosh, meow, etc. Here's an activity called Quack, Quack, Quack that encourages children to match sounds and rhymes in familiar activities. 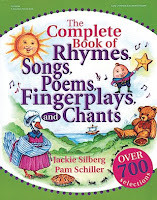 For this activity, you will need: rhyming songs and charts, and visual aids related to the story. Five Little Ducks Five little ducks went out to play Over the hill and far away. When Mama Duck said, “Quack, quack, quack!” Four little ducks came waddling back. Four little ducks went out to play Over the hill and far away. When Mama Duck said, “Quack, quack, quack!” Three little ducks came waddling back. 2) Have children repeat, reducing the number of ducks each time until you reach “0” (zero) ducks. But, when Papa Duck yelled, “QUACK, QUACK, QUACK!” Five little ducks came waddling back! Furthermore, have each child talk about common, everyday sounds they hear around the house or outdoors. Ask for volunteers to lead the group in imitating the sounds. Exploring familiar sounds will reinforce this activity. If using POCET™, this activity correlates to Developmental Guidelines: MA7: Demonstrates understanding and recognition of numerals 0-9. For more developmentally-appropriate activities, visit Teacher QuickSource® and browse through all age areas, including Preschool, Kindergarten, Infant & Toddler, and Head Start. Don't forget to explore activities promoting environmental awareness at Environmental QuickSource®. Activity Idea: Can You Hear the Beat?